Going solar has a wide range of economic, environmental and personal benefits! What’s your motivation? According to the Solar Census 2016, the industry exceeded growth expectations by adding workers at a rate nearly 17 times faster than the overall economy. The Solar Foundation estimates our industry will support 581,600 jobs by 2026. As of November 2016, the solar industry employed 260,077 solar workers, representing a growth rate of 24.5% over the previous year! Additionally, 85% of these jobs are in the installation, sales, distribution, and project development sectors. Let’s continue to grow together and support American jobs in 2018! The deployment of renewable technologies increases the diversity of electricity sources and contributes to a more resilient energy grid in the face of natural disasters. We’re thankful for our industry’s swift efforts to help alleviate the suffering caused by severe hurricanes and wildfires this year. Moreover, we are confident that distributed solar + storage solutions offer the best path towards a future defined by a cleaner and stronger energy network. Without YOU we would no be here designing and installing the best way to power your life. Clean energy powered by the sun and expertly installed by your only Fully NABCEP Certified local solar company, is saving thousands of dollars. We’re excited that you’ve taken the first step on your journey to energy independence! If you ever wanted to know about your options to go solar, now is the time to great FREE estimate. Our NextGen Home project was built on a relatively steep slope, but in a highly visible location to demonstrate how to resolve slopes in an appealing way for builders maximizing every lot in high value neighborhoods. Building a home the same size with the same performance on a flat lot would substantially decrease cost and improve the schedule. Subterranean issues are the biggest unknown on every new construction project so care should be taken to identify potential risks such as contamination or weak soils to avoid cost overruns during this phase. The site should be located within walking distance of basic needs and/or access to public transportation providing convenient access to basic needs to help reduce the necessity and costs of driving and to encourage physical activity. Because Chattanooga is in the Northern Hemisphere, the sun travels directly overhead in the summer and travels low across the southern sky in the winter. Any home can take advantage of this fact by maximizing well-shaded south-facing windows to eliminate direct gain in the summer but let the sun in and allow for heat in the winter. Saving deciduous trees (trees with leaves that fall off in the winter) on eastern and western exposures or providing deep overhangs or vertical shading elements will also help improve energy performance. Natural ventilation with high exhaust windows pulls air up through the house during months when active heating and air conditioning isn’t necessary. Blocking prevailing winter winds with evergreen trees can be useful in colder climates. The NextGen Home is 1700 SF with three bedrooms and three bathrooms and while smaller than other market rate homes with which it is designed to compete, it is more spacious than necessary. A family of four can live comfortably in well-proportioned spaces with two bedrooms and two bathrooms in 1000 SF. The best way to reduce total construction cost of a home is to reduce the amount of home that is built even though it will tend to inflate the construction cost per square foot. Furthermore, the energy loads for a small home are similarly smaller. The key to achieving a high performance home lives here. There are entire sections of libraries filled with books dedicated to the minutia of high performance envelope design but we will provide a few simple recommendations for our region (Climate zone 4). Building with advanced framing (2×6 studs at 24in on center) on either a concrete slab above rigid insulation or a conditioned crawlspace, wrapping that framing with a high performance air barrier, shooting for 1.0 ACH at 50pa (this is a measurement of air sealing and essentially measures how many times the entire volume of air in the house escapes through holes in the envelope when pressurized with a fan installed in a door. 0.60 ACH or less is achievable), and filling the cavity completely with insulation will take you a long way toward your net zero goal. We used Vaproshield for our air barrier, a vapor permeable air barrier, but Advantech ZIP sheathing is also frequently used for super tight construction. For insulation, we used Greenguard certified open-cell spray foam, but an extremely careful fiberglass installation (called a Grade I installation), blown-in fiberglass, blown-in cellulose, or open cell spray foam can all be used to achieve similar performance results at a competitive price as long as they are paired with a high performance air barrier. Look for Greenguard certified products and if spray foam is used, great care must be taken to ensure the ingredients are properly mixed and that no one enters the house 72 hours after installation. Air quality and air temperature are paramount for the comfort of occupants, especially in our climate with hot, humid summers, and cold winters. After building a tightly sealed and well-insulated envelope it is important to right-size the systems responsible for heating and air conditioning and to provide dedicated and balanced fresh air. Luckily, by limiting the size of the home, and achieving a high degree of air tightness, your system only has to heat and cool the fresh air. Our NextGen Home used two ductless mini split systems: one indoor unit and one outdoor unit for upstairs and one indoor unit and one outdoor unit downstairs. Mitsubishi’s Hyper Heat inverters are variable capacity and can heat using the heat pump even at very low temperatures when a normal on/off system resorts to inefficient emergency heat. By limiting the square footage, you can reduce costs further by only installing one of the two systems which can serve the entire house. Next air quality is extremely important, especially with such a tightly sealed house. We are often asked, is there such thing as having a house that’s too tight? The answer is no, but only when you are provide dedicated ventilation to every room with an Energy Recovery Ventilator (ERV), Heat Recovery Ventilator (HRV), or similar balanced whole-house ventilation equipment. If you air seal a home and don’t provide dedicated fresh air, you can have buildup of exhaled carbon dioxide, carbon monoxide from appliances, radon from the ground, and off-gassing from finishes and furniture, none of which are healthy. Our NextGen Home used an ERV, but in our climate, less expensive HRVs can provide much of the energy advantages at a slightly lower cost. The simplest item here is to use energy star qualified windows and doors which provides standards for both the insulating value of glass (U-factor less than 0.30) and the amount of heat the window allows in the home from direct sunlight (Solar Heat Gain Coefficient less than 0.40). Investing in casement windows, thermally broken frames, and multi-point lock doors will help improve performance further by improving tightness of the envelope, but are not absolutely necessary to achieve net zero. Keep in mind, if you are using passive solar, you will want to use the exception in the Energy Star program to have higher solar heat gain coefficients but only if the window is properly shaded and is part of a passive design scheme. TVA did great research on the integrated impact of various technologies in their Campbell Creek Automated Homes. One of the lessons was that heat pump water heaters out-performed their competition, not only because they heat water more efficiently, but they also help out your mechanical system. LED lighting is a no-brainer. The prices have fallen steeply in the last few years and you can now find even dimmable LED bulbs for less than $2 each. You can get recessed fixtures for less than $50. Unless you are heating a chicken coop, just use LEDs. Energy Star appliances are the way to go. Depending on the appliance and brand there is often minimal, if any, cost difference. Some appliances cannot receive Energy Star, like microwaves or ovens, so for those look for low wattage. If a convection microwave and a small induction cooktop will sufficiently fill the cooking needs, that will save a lot of money and energy rather than using a traditional electric range. One important feature appliance used in the NextGen Home was a Whirlpool Heat Pump Dryer which not only operates more efficiently than a typical dryer, it also saves energy by not exhausting conditioned interior air. r time, the generation value will increase proportionally, further improving the financial performance. Additional cost compared to minimum code requirements: ~$10,805 (including $4,500 federal income tax credit) adds $545 to annual mortgage payment assuming 30 year mortgage and 3.92% interest. allow homeowners to customize their home. Viewing with Protection — Experts suggests that one widely available filter for safe solar viewing is number 14 welder’s glass. It is imperative that the welding hood houses a #14 or darker filter. Do not view through any welding glass if you do not know or cannot discern its shade number. Be advised that arc welders typically use glass with a shade much less than the necessary #14. A welding glass that permits you to see the landscape is not safe. Inexpensive eclipse glasses have special safety filters that appear similar to sunglasses, but these do permit safe viewing. Pinhole projectors(link is external) — Pinhole projectors and other projection techniques are a safe, indirect viewing technique for observing an image of the sun. These provide a popular way for viewing solar eclipses. Related projection methods — One viewing technique is to project an image of the sun onto a white surface with a projecting telescope. This is explained further here: http://www.astrosociety.org/education/publications/tnl/05/stars2.html(link is external). The Exploratorium demonstrates how to view a planet in transit or an eclipse safely by projecting the image with binoculars: http://www.exploratorium.edu/transit/how.html(link is external). There are commercially available projection telescopes as well. The Solar Power World Top Solar Contractors list includes Chattanooga based solar firm. Chattanooga, TN: Coming off the biggest year ever for U.S. solar installations, local installer TENNESSEE SOLAR SOLUTIONS, LLC proud to be named one of the top solar contractors in the United States by Solar Power World magazine. Tennessee Solar Solutions, LLC achieved a rank of 240 out of 500 solar companies. “The 2017 Top Solar Contractors list features 500 of the best solar contractors in the United States,” said Kelly Pickerel, managing editor of Solar Power World. “From solar hotbeds on the coasts to the up-and-coming Midwest solar market, every installer adding even the smallest solar array to the grid is making a positive impact on our communities. The U.S. solar market installed more than 14,700 MW of solar in 2016, nearly doubling the capacity installed in 2015. For the first time ever, solar was ranked as the No. 1 source of new electric generating capacity additions brought online throughout the year. GTM Research and the Solar Energy Industries Association (SEIA) predict the cumulative U.S. solar market to nearly triple in size over the next five years. By 2022, more than 18 GW of solar photovoltaic capacity will be installed annually, Tennessee Solar Solutions, LLC will continue to be a major player in adding solar to the grid. Tennessee Solar Solutions, LLC employs 25 workers, who installed 2,216kW of solar in 2016. Since its founding in 2007, the company has installed 2MW of solar. The company’s belief that simplifying the process of going solar will be the key to its widespread adoption, Tennessee Solar Solutions provided the industry’s premier customer experience. Creating memorable experiences for customers resulted in rapid growth of the company. “Tennessee Solar Solutions was founded in 2007 on the basis of the firm conviction that solar power is a clean, sustainable energy source that is available everywhere and to everyone, “ said Anthony Roden, Founder and President. “Tennessee Solar Solutions is much more than just a project developer and installer: it is an operator which offers an integrated model for the production of solar electricity,” said Ginny Kincer, Chief Operations Officer. Posted on JUNE 15, 2017 by JACOB MARSH. 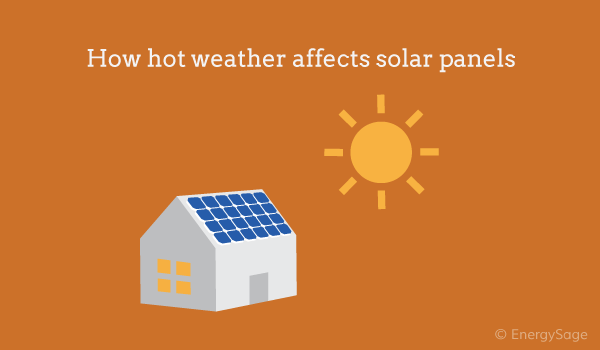 Home solar panels are typically located on the roof, which means they’re exposed to the elements. When the sun is shining down on them in the summer, they can be very hot to the touch. How can you know what kind of output losses your panels are experiencing? Manufacturers rate their products’ susceptibility to temperature in the form of the temperature coefficient, which is expressed as a percentage per degree Celsius. It is standard practice to test solar panels for power output at 25 °C. So, if a panel is rated to have a temperature coefficient of -0.50% per °C, that panel’s output power will decrease by a half of a percent for every degree the temperature rises about 25 °C (77 °F). Although that number sounds small, the surface temperature of a dark colored roof in the summer can be significantly higher than 25 °C – imagine the surface of an asphalt road on a hot summer day. The small percentage of output power loss for each degree of heat compounds.